Here’s a photo of my sister and I when we were about 8 or 9 weeks old…aren’t we cute?? 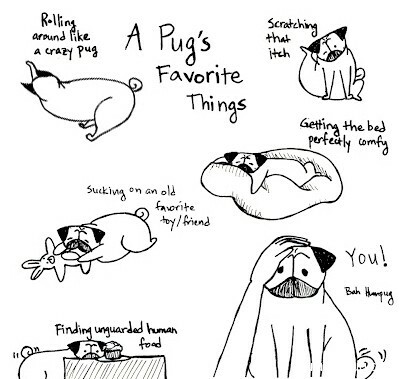 Here are the rest of my favorite pug things…drawn by the wonderful Funaek…Her blog www.bahhumpug.com is the bestest! 1. Rolling… Sometimes this is for me…sometimes this is to entertain my peeps… Either I’m distracted by my tail or I’m trying to make you laugh…or both! 2. Scratching… Ooooo….feels so good… I especially love scratching my neck after mom takes off my collar… why do I have to wear that again? 4. Toy… Sunny loves her rabbit best…I love my piggy best…it was pink…it’s now kind of brownish (mom keeps putting it in the washing machine…why? it takes me so long to get it tasting right after that)… it doesn’t matter how many toys they present me with…even if mom’s hidden piggy in the basement…I will always find her… Usually I like the tags of my toys best…but with piggy all of her is just great! 6. Mom & Dad… Mommy’s the bestest…Most days we go for a walk just the two of us…and on the weekends Dad sometimes takes me for a walk just us…and then once or twice a week we all go walking together… They spend lots of time with me…. I know I said eating and napping were my top favorite things…but really I think they’re the top of the list… I don’t know why I can’t go with them to work though… they love me, I love them… I’m a lucky pug! 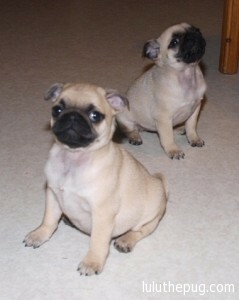 As I mentioned my Mom LOVES Funaek & her blog bahhumpug.com. 2. Licking… I can spend half the afternoon licking mom’s legs, feet, arms, hands…I only get to lick her face when I’m giving her kisses though. I also love licking my dad’s head…not everyone lets me lick their head…he’s a nice daddy! 3. Post-poop flicking… This always makes my mom giggle… If it has been an especially satisfying poop I might even throw a little snort in there after the energetic flicking… fun! 5. Bedtime… When I finally get my command to go to bed I’ve usually been sleeping for quite some time… Sometimes I’m sooo sleepy that mom or dad needs to pick me up, but other times I’m so excited and leap off of the sofa and run right to my crate…..time for my pug-beauty rest!